Students at Tunku-Putra secondary school along with teachers and representative from the charity club. When I was planning my move to South East Asia (I hadn’t settled on Malaysia yet) I tried to read as much online as I could. One of the places I decided I wanted to visit to see if I could live there was Langkawi. Langkawi doesn’t have much information available online, especially on how an expat can live there. There are not many rental options. So I diligently looked for everything I could find. One of the things I found was a reference to a charity helping pay school fees for some children in Langkawi. Education in Malaysia is not free and many families find it financially difficult to meet the costs associated with sending their child/children to school. Helping a child get an education seemed like the kind of thing that was worthwhile (I knew I wanted to contribute in some ways to where ever I settled down). I also knew it was easy to get busy and not get these kind of things taken care of. So I arranged to contribute before I went to Langkawi. I did so and was able to sponsor one child this last year. Last week I received a report that he has graduated from Tunku Putra secondary school and is looking forward to college. The program, by the Charity Club Langkawi, Kedah was able to fully sponsor 41 Schoolchildren in Langkawi in 2011. The Charity Club Langkawi “are being referred to a growing pool of young people who are very bright and are not able to attend, or drop out of, university because of lack of available funds.” It seems to me the charity club does great work. If you are an expat in Malaysia consider contributing. You can also sponsor a family or contribute in other ways if you prefer. If you know of similar clubs in Johor Bahru, or elsewhere in Malaysia, and a comment below. I ended up not staying in Langkawi. It is worth considering but the rental options are very limited. There also isn’t much going on. But it has great beaches and wonderful food. I decided on Johor Bahru instead. There are several good restaurants on the bottom level of the Danga City Mall in downtown Johor Bahru. One of my favorites is JB Station Kopitiam. I have had at least 5 meals at JB Station Kopitiam, all have been excellent (and they have been under RM 10). 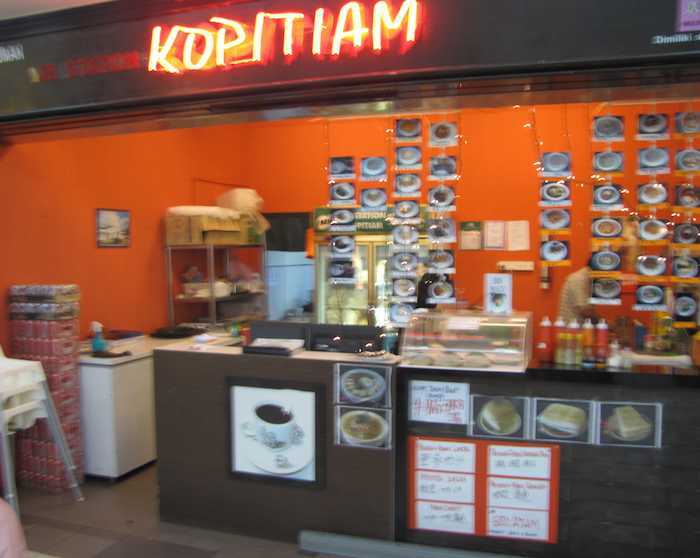 A kopitiam is a traditional breakfast and coffee shop found in Southeast Asia. The word is a concatenation of the Malay word for coffee and the Hokkien dialect word for shop. 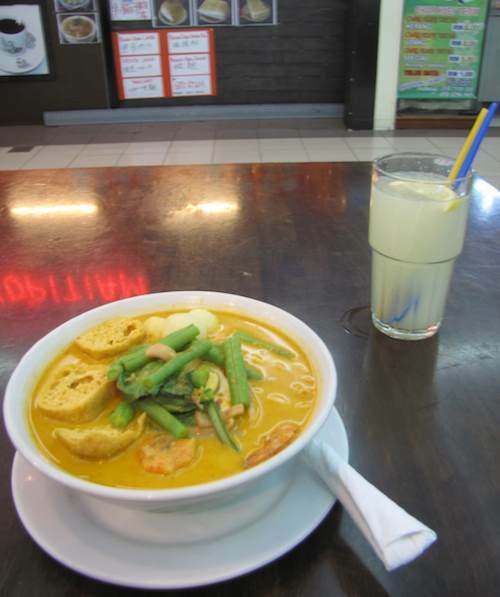 I still don’t know the names of lots of Malaysian food, so one nice thing about JB Station is they have photos so I can find a picture of something that looks interesting. 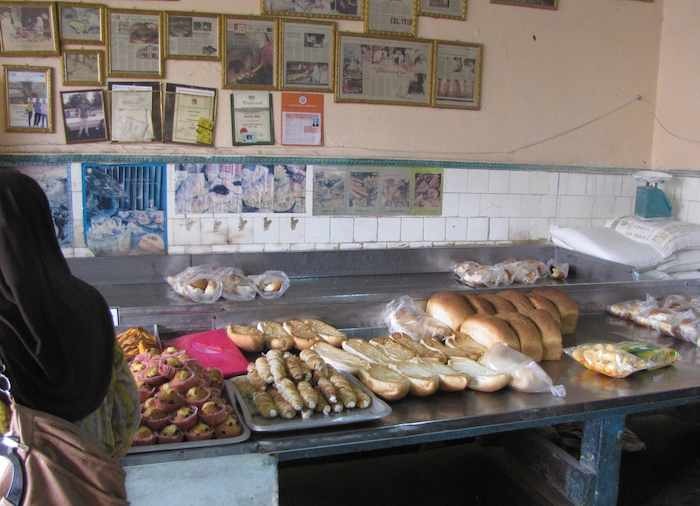 A decent number of restaurants do that, however, at the same time, a large number have no menu at all (especially the outdoor stalls, but also some indoor restaurants). I am not completely sure but I think the photo shows my order of Mee Bandung (a dish originating in Johor). Mee Bandung, is a cuisine originally consisted of only noodles and eggs in soup made of the mixture of chilli, onion, spices, shrimp paste and dried shrimp. Over time the Mee Bandung recipe had been added to with the addition of shrimp, meat, fish cakes and vegetables. One thing I have noticed is the small Malaysian restaurants have a full or half hard boiled or fried egg on top of many dishes. The lime juice is freshly squeezed and quite good. 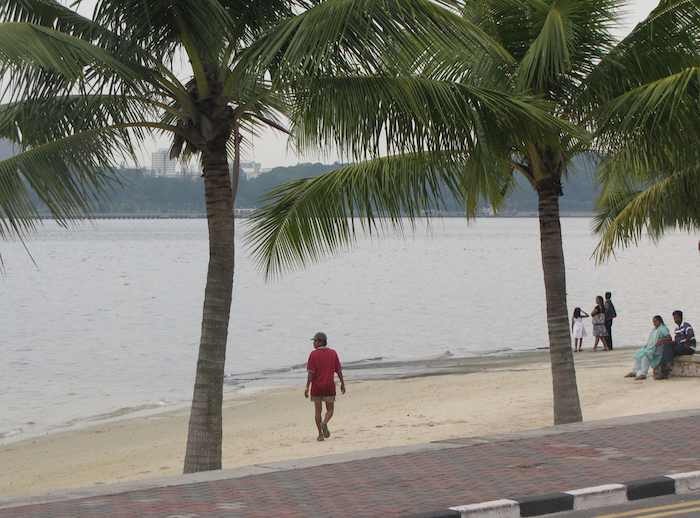 Johor Bahru is not known for long sandy beaches. But it does actually have a beach, see the photo. This is over near the Zon (duty free area) where the ferry is. Singapore is visible across the water. Swimming might not be the greatest idea, though I did see 2 people swimming once. You can also find some people selling fresh seafood along the walk. It actually is a nice walk along the water. If the city did a better job of featuring it, it is possible to make it into something really nice. I don’t see anything about the walk in Penang along Gurnsey drive that is any nicer. But if you really want a beach Malaysia has plenty of great beaches. Langkawi is the best beach location I have been to yet. 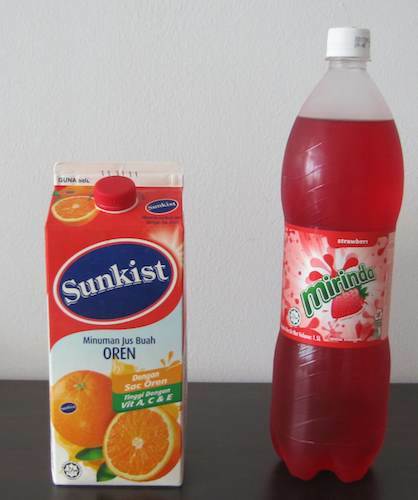 Two drinks I have enjoyed since moving to Malaysia are orange juice and strawberry soda. Ok, the strawberry soda is just sugar water with some flavoring (that tastes nothing like strawberry to me) but I like it. What I really like is the orange juice. In the USA they have orange juice with pulp (essentially the inside of the skin of the orange. I don’t like pulp. This orange juice has intact orange “capsules.” I really don’t know what you call them, but the tiny bits of the orange that actually have the juice inside of them. The juice in the photo has lots of those floating in it, which are yummy. I also like fresh lime juice and really most fresh juices. Green tea is nice, and I have been drinking much more tea recently. One thing I still haven’t figured out is what some places mean by yogurt. Some smoothies are great with really yogurt. Several places though obviously have no yogurt in what they call yogurt drinks – they are just juice flavoring with crushed ice. I took the bus from downtown Johor Bahru to the Jusco (hypermarket) in Permas Jaya. From downtown you take bus number 123 which a passenger told me runs every 20 minutes. Of the supermarkets I have been to so far in JB that Jusco has been by far the best. I have tried a couple Tesco’s and a Carfour and one other Jusco (a complete disaster area, the store was a complete mess, the signs said things were 50% off then when you took them to the counter they said they were not – 3 different items from 2 different locations). 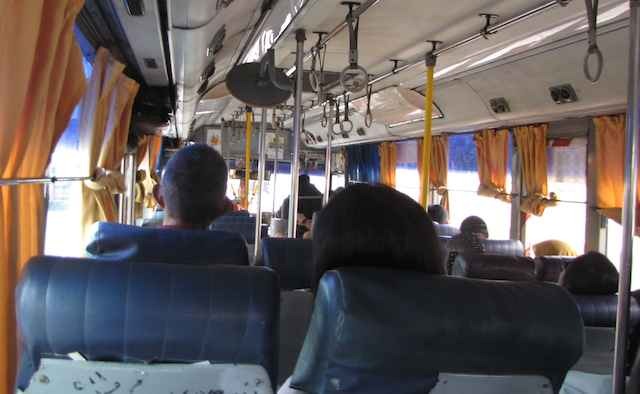 Inside of a Johor Bahru 123 line bus, by John Hunter. The Permas Jaya Jusco store itself is very clean and orderly. The prices seem the best to me. The vegetables were great this time (the first time I really checked). A great selection and very fresh looking. And the prices were great. I picked up baby asparagus, peppers, potatoes, Japanese and “regular” cucumbers. I am not a cook. My cooking tops out at microwaving the asparagus for a few seconds, reheating some Indian food or putting peanut butter on a roll. Unfortunately the Jusco is a bit out of the way for me. I want to get familiar with the bus transportation though so I will be taking some trips. I can’t find anything good online that explains the bus routes. If anyone knows of a good source of information please let me know. I went to the Village Briyani Cafe today and had chicken briyani. It was great. 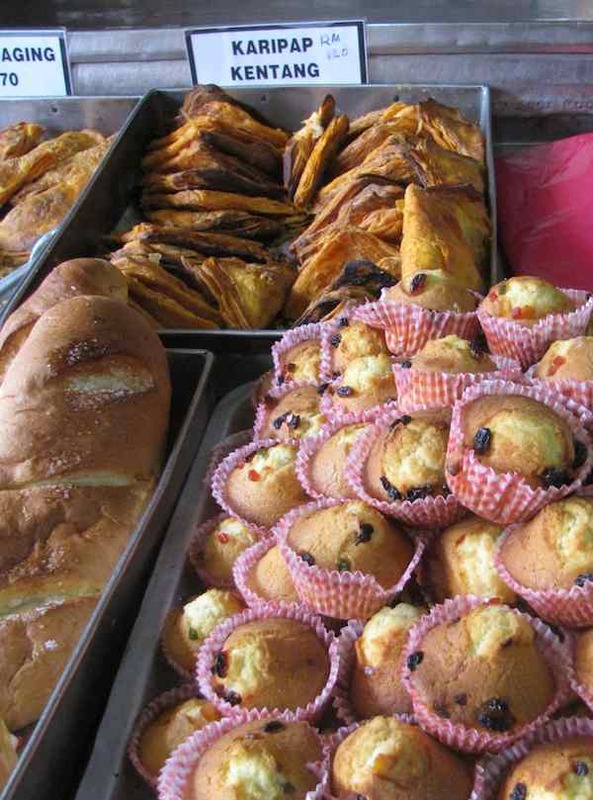 This bakery in downtown Johor Bahru has excellent breads and great prices. It is downtown in the historic district. It is on the same block as the Masjid India (an Indian Mosque).